It took three attempts for our group to get to Rick’s pick, Malecon in Washington Heights. The journey to the busy corner of 175th Street and Broadway where Malecon is located had its winding trails and steep inclines, but in the end was worth the effort. 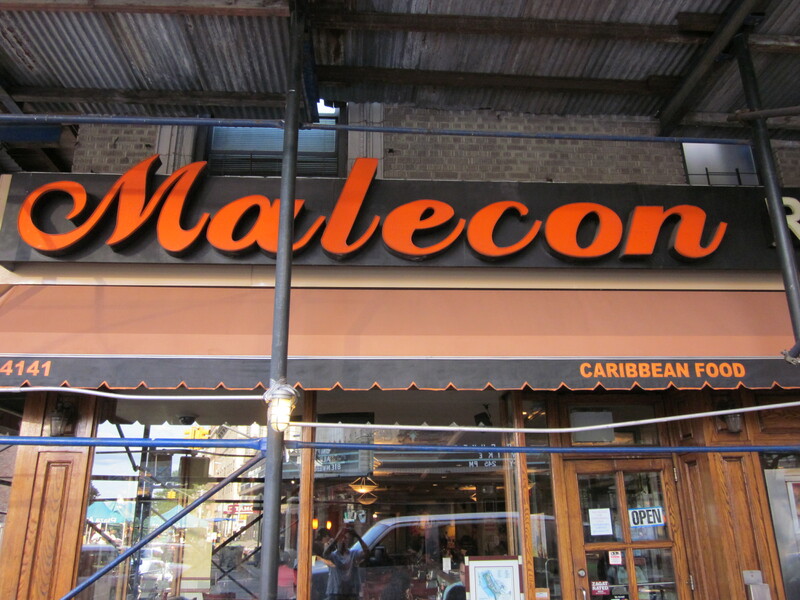 Malecon was touted by Ubie, Rick’s hairdresser/stylist/barber, as the best place for “Dominican” food in New York. And though we don’t know anything about Ubie’s food savvy, Rick’s hair is definitely impressive, so we just had to go on that. The first detour on our trip to Malecon occurred a couple of months earlier when on the date we were to gather, Rick informed us that there was an event at the Brooklyn Brewery in Williamsburg featuring the barbecue of Myron Mixon. 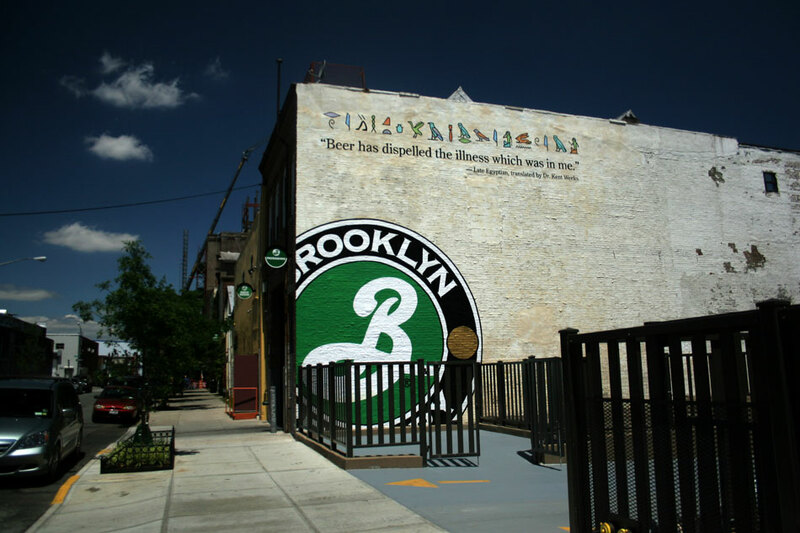 The Brooklyn Brewery: The first leg of our journey. Though I’ve been through a few barbecue wars myself, I don’t follow them on television. Apparently Myron Mixon is a barbecue celebrity and had just written a book on his expertise. This event was in celebration of that publication and included barbecue prepared by Mixon himself. Rick’s influence got our group invites to the event and he presented us with the option of the “Dominican place” or free barbecue and beer. Our decision was unanimous. 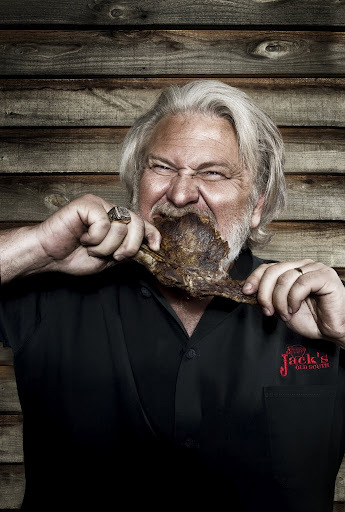 We would postpone Rick’s pick to experience the Brooklyn Brewery and Mixon’s renowned barbecue. After arriving promptly at the Brooklyn Brewery on an empty stomach and quickly downing two very cold and very delicious beers, while waiting (and waiting) for Mixon to lay out his food, I desperately reached for the pickles—the only thing to eat—in hopes of not passing out in a mound of barbecue. Finally the ribs and brisket were assembled on the steam tables and our group, showing the skill and confidence accumulated by years of experience, positioned ourselves at the front of the buffet line. Our plates piled high, we began to dig in. The ribs were worthy of Mixon’s reputation; seasoned perfectly, smoked to moist tenderness topped with a subtle glaze of semi-sweet sauce. The brisket, however, even sliced thin, was like eating shoe leather. How could a barbecue master allow such a debacle? Shouldn’t pride itself prevent one from tarnishing one’s revered status? In other words, if I were Mixon, I would have dumped all the inedible brisket rather than foisting it upon the scavengers lining up for the buffet. But that’s just me. Myron Mixon displaying his gnawing ability. A few weeks later, channel surfing, I noticed Mixon’s silver-bearded visage on television. He was on a barbecue competition called “BBQ Pitmasters” on TLC (The Learning Channel). I watched as he competed in the “ribs” category and came in third behind a man named Tuffy Stone and the winning team called “Slap Yo Daddy,” comprised of Asian-Americans from California. When the results were announced, Mixon had the same look on his face that I did when sampling his brisket. A month later, we tried again to visit the “Dominican place” recommended by Ubie. Late on the afternoon of our scheduled gathering, Rick emailed to say a work crisis had come up and he would have to cancel. I was on my way to a Little League tournament game with my son in the Inwood section of Northern Manhattan. I thought I might be able to get to the dinner in nearby Washington Heights, son in tow, if his game ended promptly. But Eugene was cranky and wanted to meet sooner than later; bitter that when most of the world was sleeping, he would be camped out on the RFK Bridge overseeing construction there. Since this was Rick’s choice, it didn’t make sense to assemble without him, but I was away from my email and deferred the executive decision whether to cancel or not up to Gerry. He, wisely choose to cancel. Malecon’s cafe con leche receptacle. We quickly rescheduled and this time there were no cancellations. I admit to not being a stranger to the food of Malecon. Though the Malecon I was familiar with was on the upper west side and known, to me, as “El Malecon.” A visit to Malecon’s website revealed that they were related. The Malecon in Washington Heights was most definitely the big brother of the two. 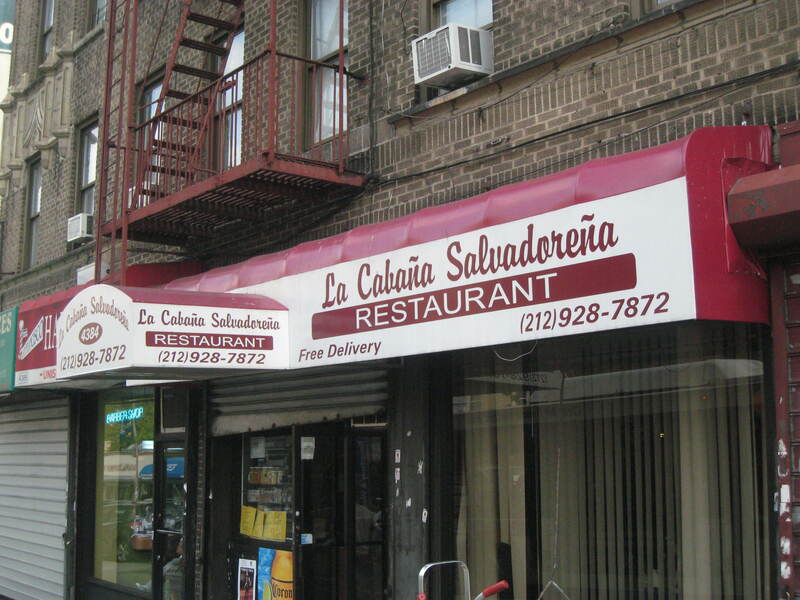 Not only was it located in the heart of New York’s biggest Dominican community, it was larger than “El Malecon” and its menu was much more extensive. 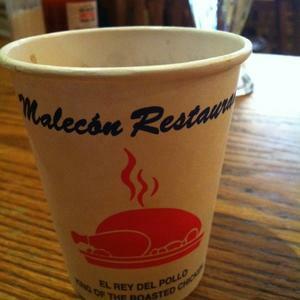 My experience with El Malecon centered around the monstrous roast chicken dinners they featured that included rice and beans or other starches like yuca, tostones or maduros. That and the restaurant’s addictive café con leche that went perfectly with its “desayuno,” the hearty Dominican breakfast comprised of longaniza (sausage), eggs, mangu (mashed green plantains) and guineo (boiled green bananas). 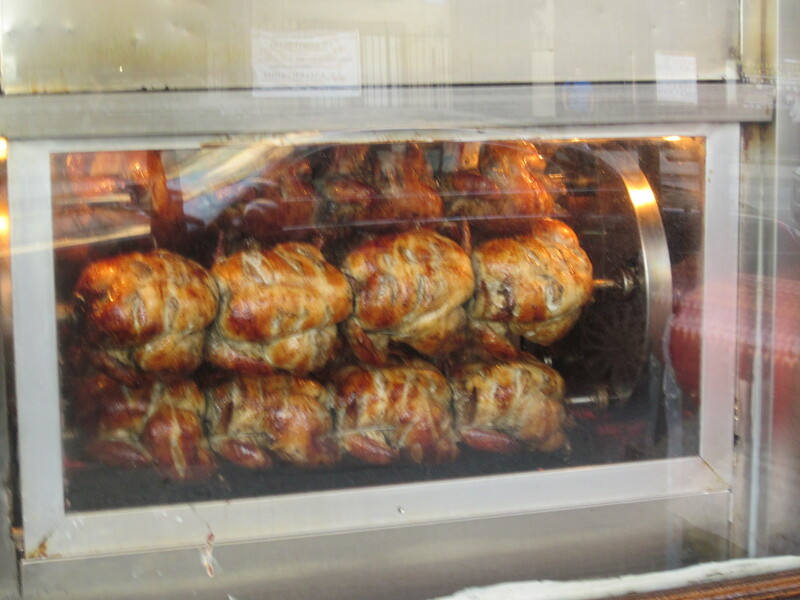 The self-proclaimed King of Roast Chicken. The Malecon in Washington Heights had everything El Malecon had on the Upper West Side and much more including a large selection of mofongos, parrilladas (grill combinations) and something called picaderas. 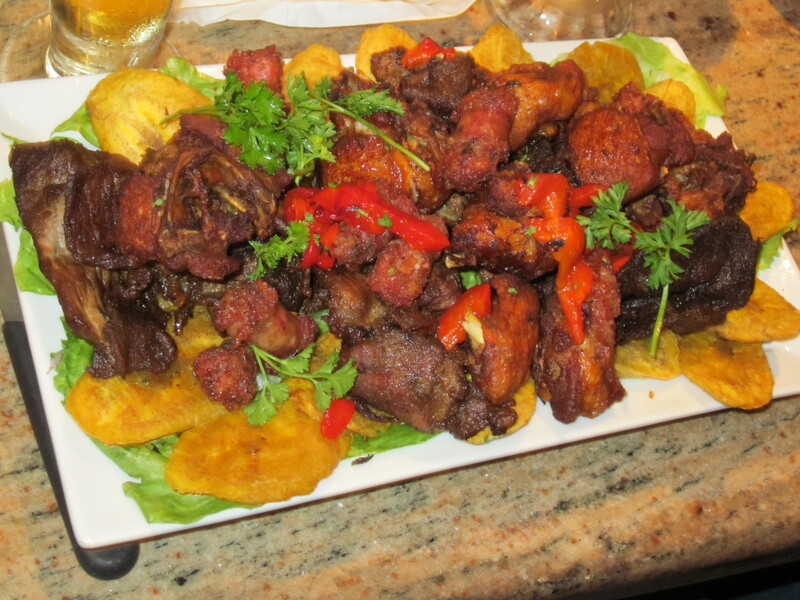 Gerry ordered a pequena (small) picadera plate that was big enough for at least half of our rotund group and included a combination of fried meats; sausage, beef, pork, and chicken along with fried plantains. Big brother Malecon, unlike El Malecon, was much more festive with tropical murals, meringue blasting and offering ice buckets of Presidente beer which, without hesitation, we crowded our table with. There were side dishes and a few appetizers that looked tempting and Rick considered a few. I shook my head. “It will be too much,” I said, recalling my previous El Malecon experiences. And I didn’t get an argument from anyone. 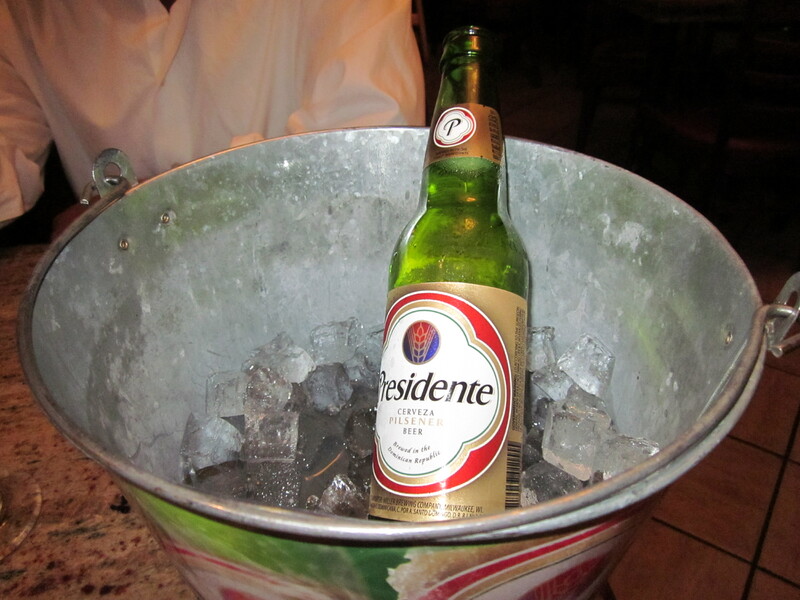 A Presidente to accompany the King of roast chicken. The vast menu made choosing difficult but I narrowed my choice down to one of that day’s specials—Malecon has a number for each day of the week—thinking I might get the roast pork or the bbq beef ribs. I went with the latter along with gandules (pigeon peas) and rice. Mike from Yonkers was considering a mofongo, but realized he didn’t get rice and beans with it…as if he needed more starch. 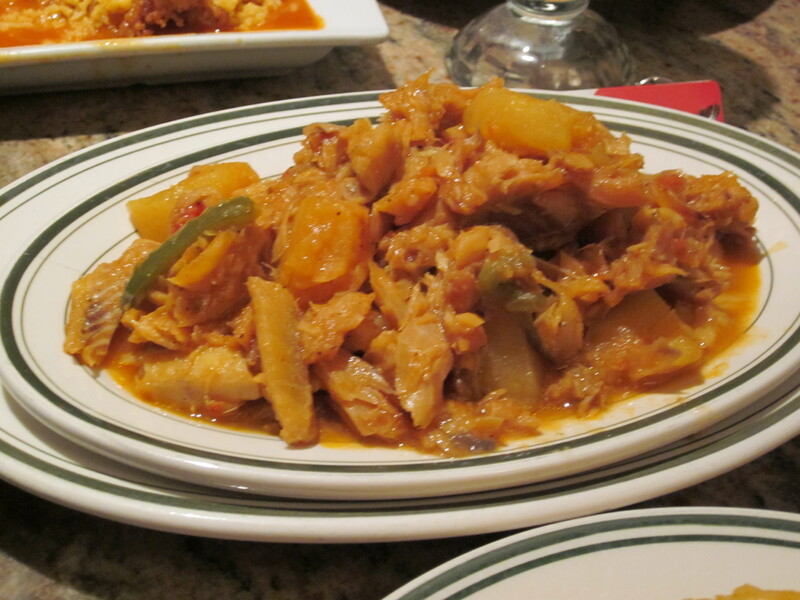 Instead, he chose the codfish stew. As I expected, the platters were large, the food densely delicious, though the ribs a tad on the sweet side, and the Presidente the perfect accompaniment. It was no reflection on Malecon’s quality, however, that everyone, excluding Eugene and myself, had leftovers; a first for our group. Despite being overstuffed, I couldn’t resist sampling the coconut flan while Rick and Mike from Yonkers were easily convinced by our waitress to try the tres leches (three milk) cake. 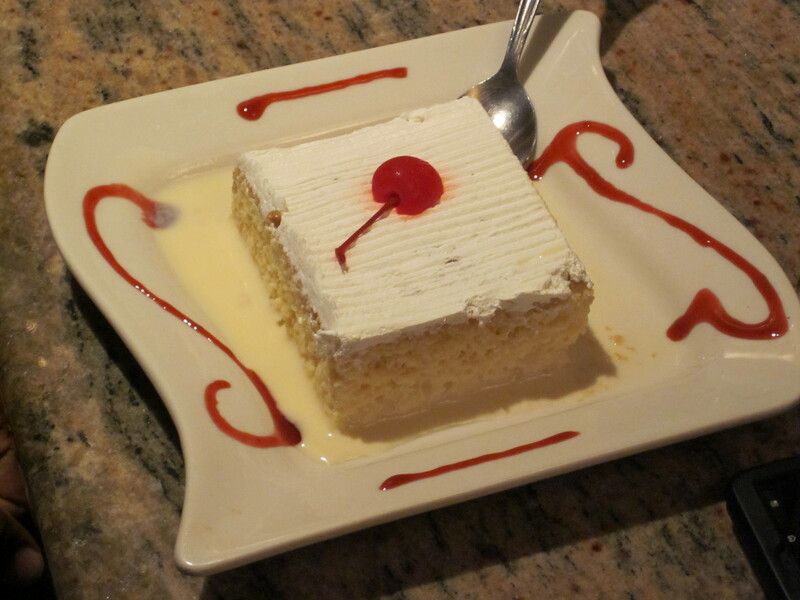 The flan I had was as dense as the rice and gandules, but the tres leches was moist, dripping with sweet milk and so good that it alone would make another journey, detours and all, to Washington Heights a high priority. Still in our first year, but now on our second round of picks, Charlie found La Cabana Salvadorena “in the heights”…several years before the musical of the same name opened. I remember driving up and around the hills past the George Washington Bridge trying to find parking. I also remember how glad the owners and chef were to have us at his restaurant. Something that happened quite often throughout our years doing this. 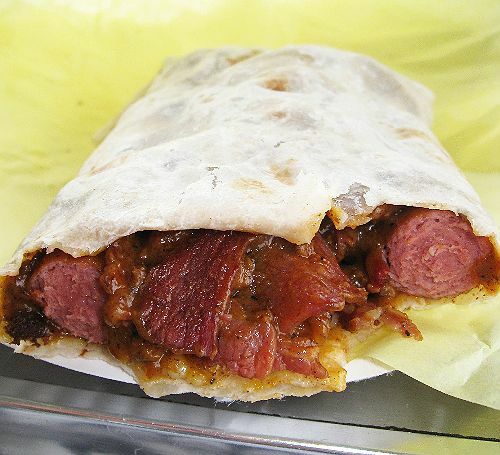 wrapped in a big burrito-sized flour tortilla and stuffed with pastrami, cheese, chili and onions. The Oki Dog experience I still remember fondly as a youthful indulgence akin to experimenting with a hallucinogenic drug. I had no limits when it came to hot dogs, but I could not get myself to try a pupusa. There was the connotation with something cuddly that just turned me off. So here, many years later on a cold damp autumn evening in Washington Heights, I think I was ready to try a pupusa. Zio and I were the first to arrive at the brightly-lit restaurant. We choose the big round table next to the “Real Women Have Curves” poster. Our waitress came up immediately to begin taking our orders. I held out my fingers in the right manner to alert the waitress that there would be six of us and ordered a Presidente beer. The waitress obviously knew little or no English and Zio and I pointed to the menu helping her to understand. And looking at the menus, which were under the glass on the table, we noticed different variations of the same menus. One item on all the different menus, however, was consistent: pupusas. After struggling to find parking, the others soon all arrived. I warned them that getting help on what to order from the exotic menu might be difficult considering the language barrier with our waitress. No sooner had I said that than Raul came to our rescue. Raul, it turned out, had no financial attachment to La Cabana Salvadorena; he was an electrician and a friend of the owners. He offered his bilingual services to us along with his expertise in choosing the best items on the menu. We gave Raul free reign as what to order for us. We trusted him implicitly. And Raul, despite being from Honduras rather than Salvador, delivered. He came back with pupusas, rice and corn flour patties, stuffed with beans, pork, and cheese. He picked a mixed seafood ceviche for us, a few platters of “Plato Tipico” a combination plate of typical Salvadoran food; thinly pounded steak, steamed chicken tamale in the husk, a cheese pupusa with “loroco” a grated cheese, sweet plantains, and a “tortilla;” an omelet with chorizo and onions. We engulfed it. Consumed it. Devoured it all including the tasteless cabbage salad that came in a jar and was on every table. While we were eating, the chef, who also spoke little or no English came out to check on our progress. Looking somewhat like the actor, Edward James Olmos, the chef was impressed with our work, though upset that Raul had neglected to order us the boiled beef, also a Salvadoran specialty. Next time, we promised. He went away smiling and satisfied the gringos were pleased. As with most of our experiences, dessert was limited here as well. We all sampled a piece of what seemed like fried dough in sugar syrup. Eugene immediately proclaimed the meal as his favorite of the seven we had experienced. And it certainly fulfilled our original aim; even with beers and other drinks, our bill came under $20 per person. We were getting pretty good at this. I returned to La Cabana Salvadorena recently. I was glad to see that pretty much nothing had changed in the eight years since I’d last visited. They had no website and there were no stickers from Zagat, Yelp, Citysearch or anywhere else on their windows. The awning, small front counter, and dining room, with the exception of the “Real Women Have Curves” poster being gone, was exactly as I remembered it. But best of all were the prices—still frozen at 2002 levels.